A special discount to all filipino consumers this holiday season. 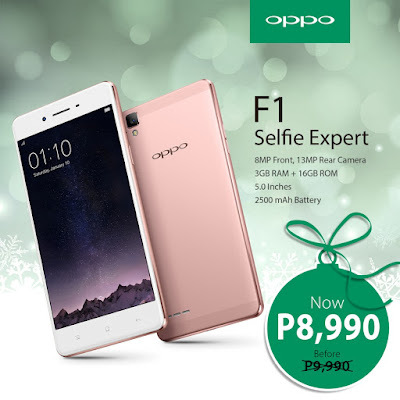 Get a P1,000 off on your OPPO F1 smartphone starting December 9. The smartphone features an 8-megapixel Selfie camera with a f/2.0 wide aperture lens and a 1/4 inch sensorto capture vibrant selfies even in less-than-ideal lighting. Selfies taken by the front camera are 30 percent clearer than photos captured by a 5-megapixel camera. They are also 44 percent brighter than those taken with an f/2.4 lens. The OPPO F1’s front-camera is also equipped with the Beautify 3.0 app, which has three beautification modes and various filters to give selfies a flawless look. The discounted OPPO F1 smartphone is available at all OPPO concept store/kiosk and other partners dealer stores nationwide. For more information, visit OPPO Philippines’ Facebook page at www.fb.com/oppophilippines/ or log on to http://www.oppo.com/ph/index.html.